What size apartment can you rent for $1,500 in Philadelphia? Apartment List analyzed where in the United States you can you get the most space for your rental dollars. Yes, Philadelphia's rent fell (a hair) last month, but that barely made a dent on the city's ranking among the most expensive rental markets in the country. If you've ever wondered just how far your rental dollars will go in cities around the country, Apartment List has the data visualization tool for you. 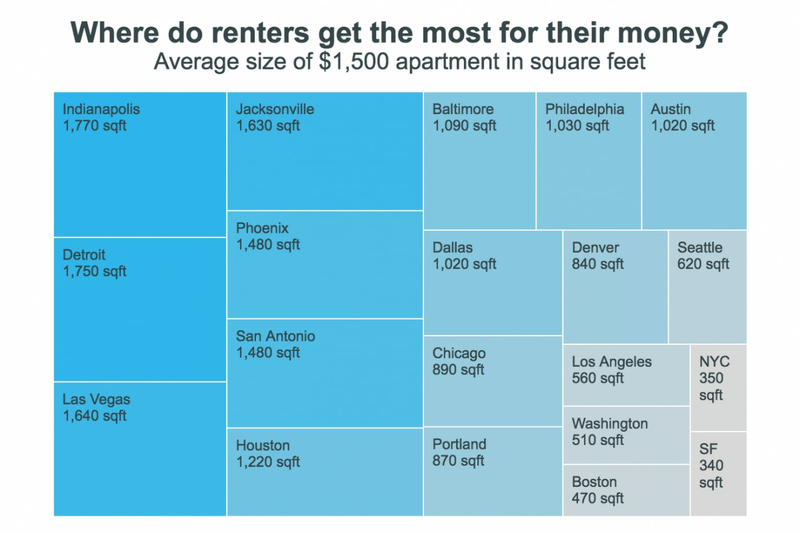 The rental agency created an interactive graphic to compare how much space you can get for $1,500 in monthly rent across the country. In Philadelphia, it's approximately 1,030 square feet. Within the city proper, the agency calculates the price per square foot to be about $1.45. But in the greater metro region, the price is about $1.27. So your $1,500 monthly rent will get you up to1,190 square feet in the burbs. At 85 cents per square foot, Indianapolis was the most inexpensive city on the list. In San Francisco, long among the most expensive cities for renters and homeowners alike, $1,500 a month will rent you exactly 340 square feet. Which makes 1,030 in the 215 area code feel downright palatial.